When you’re on the brink of investing in a new business opportunity—a new product or service, a major change to the existing business practice, etc.—your excitement is probably tempered with concern: Is this idea worth pursuing? Do our customers actually want this product? Will they use it? Will we be better than the competition? A Design Sprint eliminates these uncertainties. It’s a low-risk approach to defining your digital product or service creation, and ensuring you have the validation needed to invest in a full roll-out. The concept of the Design Sprint was created by Google Ventures and then adopted and championed by companies across the globe. 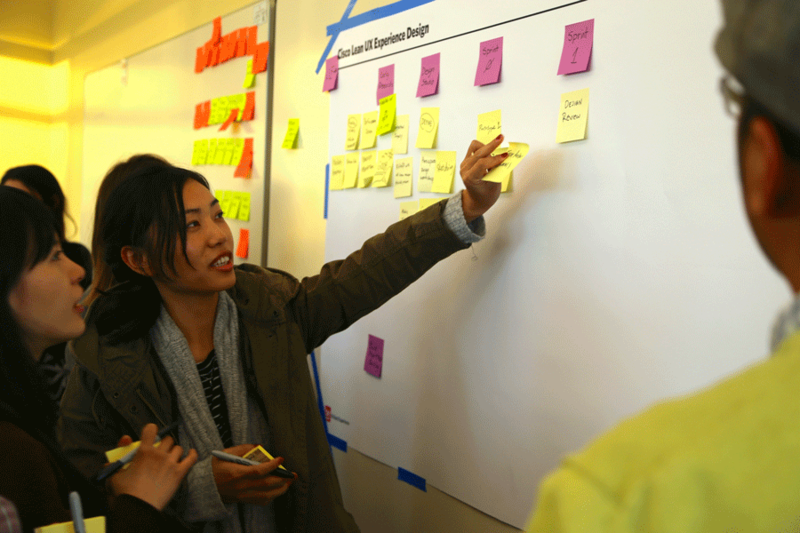 The process promises to help your team get into a solution-focused mindset, clearly define a product vision, and take the product from initial design through prototyping—in just 5 days. Sounds great, right? While the 5-day sprint is very effective for identifying and fleshing out product features and hauling your team out of a creative slump, it’s not enough time to innovate and test a full-featured prototype. If your goal is to determine whether or not a product will truly resonate with customers and deserves investment, you need more than 5 days. That’s why our Design Sprint is a bit different. Our sprint is still fast – usually just a few weeks. But, unlike its 5-day predecessor, our sprint begins with substantial customer and competitive research, focuses on the complete product (not just product features), includes prototype testing with representative users (i.e. real-life customers), and results in a complete fully interactive prototype. We reach these goals through a process of empathizing, strategizing, and designing. By identifying opportunities and validating your prototype with a microcosm of your customers, we uncover customers’ true needs, identify market opportunities, and analyze competitors’ tactics. But before we get started, we must ensure that the right stakeholders are in the room. The appropriate design sprint participants will vary by organization, but generally the stakeholder priority meetings should include individuals who manage the business unit or product suite in question. You should also include the marketing team and any internal user experience or design groups. And while senior executives need not be involved in the entire sprint, it’s critical to get their buy-in throughout the process, to avoid needless backtracking. Working within the context of a near future will dilute innovative thinking and prevent true business transformation. A me-to product will not future-proof you from your competition. Current limitations within the business—technology shortcomings, a particular manager’s point of view, a clunky IT process, etc.—should not be allowed to cloud the design sprint. On the contrary, the constellation of business and end-user needs should drive the IT strategy going forward. A design sprint is useless if the final product direction is rejected by the executive team. Periodic briefings with the ultimate decision makers will ensure the product/service aligns with your company’s long term strategy and priorities. This is why working with an outside sprint-trained team is so important. Skilled facilitators can identify these three horsemen and keep the team on track, so the sprint will produce the most valuable end product or service. Interested in learning more about design sprints? Contact us today to set up a quick discovery call.